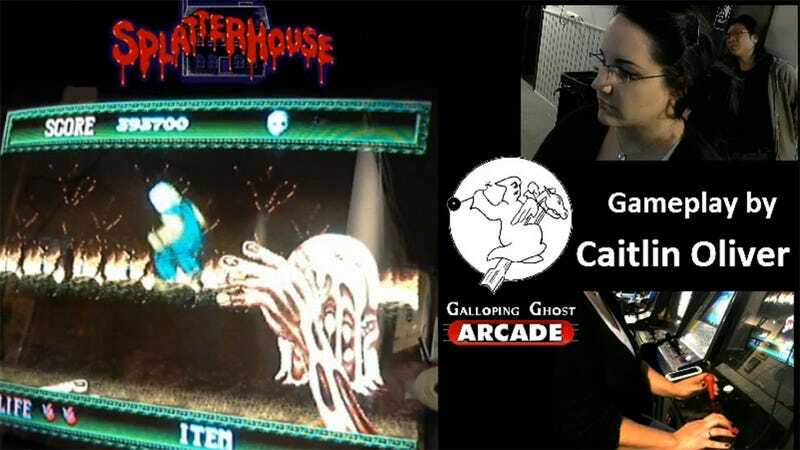 On Saturday, September 19 at the Galloping Ghost Arcade in Chicago, Illinois, 30-year-old Caitlin Oliver set the new world record for the arcade version of Namco's classic beat-em up, Splatterhouse. According to video game historian Patrick Scott Patterson, the last time a woman set an arcade game world record, Caitlin was around one-year-old. The old Splatterhouse record was 373,100 points, set in the same arcade a year previous by one Anthony Paparo. Oliver broke that record twice on Saturday, racking up 405,100 points in her first run and then further padding her lead with a 493,700 point follow-up. Oliver describes the experience of breaking the record in an interview Patrick Scott Patterson. "The first time I finished, when I initially topped Anthony's score, I thought my heart was going to pound straight through my chest," Oliver said. "It was possibly the most intense rush of adrenaline I've ever felt in my life. It was unreal to have decided to work to accomplish something and proceed to become the best in the world at something. Utterly incredible feeling. I nearly ran outside for a cigarette afterwards." The previous woman to achieve an arcade game world record was Doris Self, AKA the world's oldest video game champion. She set the world record for Q*Bert — 1,112,300 — on July 1, 1984 at the age of 58. Though her record didn't hold, Doris continued competing until her death in 2006. Her efforts to reclaim her score were chronicled in the 2007 competitive arcade gaming documentary The King of Kong: A Fistful of Quarters. Why aren't there more women breaking arcade game world records? For what I figure, there aren't all that many people going after these records, period. That, and the drive to conquer these sort of games is rooted in nostalgia, and there weren't nearly as many girl gamers back when arcades were on every street corner as there are today. In my town, at least, the boys went into the arcade and broke things, while the girls hung out in the food court, setting fires in the ashtrays with hairspray. "I first got my hands on Splatterhouse as a young girl," she recalled. "My father picked up a TurboGrafx-16 for me one lucky Christmas and he was always good about letting me pick out a game to rent for the weekend at the local video rental stores. Once I got it home I was totally hooked. Gross monsters, corpses, skeletons; it had it all." See? Nostalgia. Weird nostalgia, but definitely nostalgia. Oliver's feat was streamed live via Twitch over the weekend, and is archived here.